All of your professional and personal correspondence will have a powerful impact on the receiver because you have used the letterhead template that is included on this page. Don’t waste precious time trying to compose the perfect letterhead. Create a unique personal letterhead with the template. The letterhead template is a great choice for those who want to establish a professional image. Simply customize the included fields with your own specific information. The personal letterhead template includes ready-made themes and design. It is easy to customize those items and make them very unique. 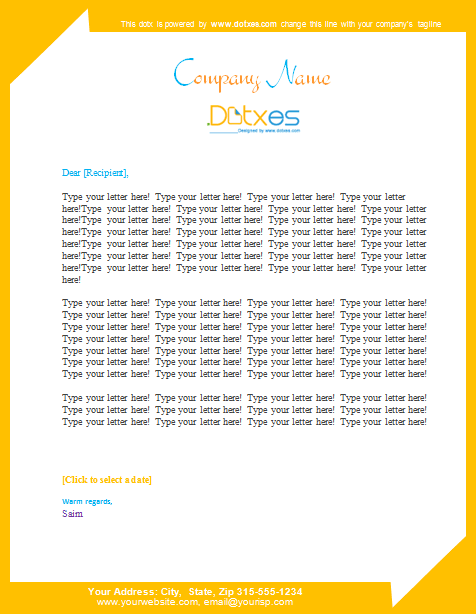 The features of the letterhead template include the company name field, the address field, salutation, body, and closing. Take a look at those features. Change the logo to fit your company. Change fonts to match your company logo. Change the salutation or closing with something more professional or casual. It is your choice. Download this personal letterhead now. This letterhead template will give all your correspondence a fresh and very professional look that will definitely impress the receiver and improve your company image.